It’s a great mystery, even in Korea. With my cultural background and family history, along with a lot of experimentation, I’ve become pretty good in the fried chicken arts–at least in the Southern fried chicken territory. In the past, I have also succeeded in mimicking the flavor of my favorite Korean chicken brand, Two Two Chicken, which is the classic fried chicken hof style. The hard part is getting the texture right. Eun Jeong and I went on the internet. We also checked out a TV program that quickly went behind the scenes of a chicken joint but didn’t divulge the secrets. I found a few recipes for Korean fried chicken, like this one in The New York Times from the cookbook Quick and Easy Korean Cooking (Cecilia Hae-Jin Lee), but none of them sounded like what we have in Korea. Eun Jeong checked Korean sites, and none of them sounded definitive. We then had a little pow wow about what we’ve heard over the years in Korean fried chicken techniques. We decided to try three different approaches from our research to mimic the Two Two style. We used potato starch, but corn starch is more available in American kitchens. To each of them, I added the flavorings. Two Two has a distinctive Chinese five spice scent, particularly star anise, with a touch of cinnamon. You can smell it whenever you’re in the vicinity of a chicken hof. For an added bonus, I also experimented with making the Kyochon Chicken style. Kyochon is batter-based and has a deep garlic flavor with a little sweetness. Since my primary goal was hitting the right texture, I didn’t bother to marinate the chicken. You can do that step if you want to. A diluted solution of raspberry vinegar is my preferred choice, but use any acidic marinade you want. Chicken in this part of the world isn’t cut on the joints like western chicken. It’s hacked into bite-sized pieces with a Chinese cleaver or shears. It turns it into a challenge when trying to distinguish white and dark meat. But keeping it small helps it fry more quickly and evenly and works well for group eating. I should also note that a lot of restaurants fry chicken halves or quarters and hack them up after frying. Breaking out my candy thermometer, I heated some vegetable oil between 300 to 350 degrees F. I had two or three pieces for each style and fried them separately for around five minutes each, draining them in a colander before putting them in their own little bowls. Here we go. When they had all finished, I pumped up the oil to 375 degrees F. I then fried them a second time for around 2-3 minutes. This one looked very close to the Two Two style. The skin was papery and crinkled. The breading was light. Eun Jeong and I tasted it. Our conclusion–it was light but not crispy enough. In fact, it was a little rubbery and powdery. But it was close. This looked heavier than what we got at the restaurants. Eun Jeong thought it looked the same. When we bit into them, we felt they were just about right. Just needed a little more salt. Scary looking. Eun Jeong liked this a little bit. I spit it out into the sink. We hit this one on the target. Glassy shatter on the crust. The inside exploded with juice. The taste was strong in garlic with a hint of sweet. In hindsight, I don’t think double frying was necessary. So the winners were the Kyochon Batter and the Starch-and-Flour mixture. Here are the formal recipes. 2. Combine all the dry ingredients. Heat the oil to 300 degrees F, not going over 350 degrees F.
3. Dredge the chicken pieces in the dry mixture and dust off so that there is just a light dusting on the chicken. 4. Fry just a few pieces at a time for around 5 minutes. 5. Drain the chicken and increase the oil temperature to 375 degrees F.
6. Fry the chicken a second time for 2-3 minutes to get a crispy texture. 7. Drain and serve immediately. 2. Combine all the dry ingredients. Add water a little at a time until it becomes a thick batter, like pancake batter. 3. Heat the oil to 350 degrees F.
4. Dip the chicken pieces, one at a time, in the batter. Let the excess drip off and fry them in the oil for around five minutes. Don’t overcrowd. Fry just a few at a time. The reason a lot of people love Korean fried chicken is the garlicky pepper sauce. You can glaze the chicken with this or use it as a dipping sauce. I’ve seen many versions of this on the internet, and I’ve broken it down to its essential components. You can add anything extra you want, such as pureed pineapple, apple or kiwi, which some restaurants do. Replace the corn syrup with honey. My version is very peppery. What you’re trying to accomplish is a shimmering glaze that’s fruity, garlicky, slightly salty and smooth with a good pepper kick. I’ve seen recipes that dilute it with ketchup, but no ketchup dares go near my fried chicken, bubba. 1. Mix all the ingredients in a saucepan. 2. Heat slowly until it bubbles and the garlic has time to soften and steep. Be careful not to burn. 3. Drench the chicken in the sauce and garnish with sesame seeds. So here we finally have Korean fried chicken recipes on the internet from Korea itself, based on the flavors of real Korean chicken hofs. Try this at home and add any techniques, observations or critiques in the comments. Like all restaurant copycat recipes, these aren’t exact but pretty close. NextTop 12 Dishes That We Like? I gotta be honest: they don’t look so great in the last photo. Maybe it’s the camera. Great work testing out different styles of making fried chicken! For the sauce, I used 고추장, 고추기름, 고추가루, 물엿, 소금,호추, cinnamon powder, 생강, 마늘, 참기름, 참 깨 I don’t take measurements >.< A little bit of this and that..haha..and you get 90% BBQ 양념 sauce! Oh poopoo on the last comment. I am grateful for this because here in Anjeong Ri all I have seen is another type of chicken hof. I wish we had a TwoTwo here. If anyonne knows of one nearby I would be eternally happy. Pyeongteak station is nearby, so thats not too far. Thanks for the recipe Joe. I’m going to try it! What I have found is that when I use starch only they get soogy soon after being put in any sauce. Thanks for your efforts! 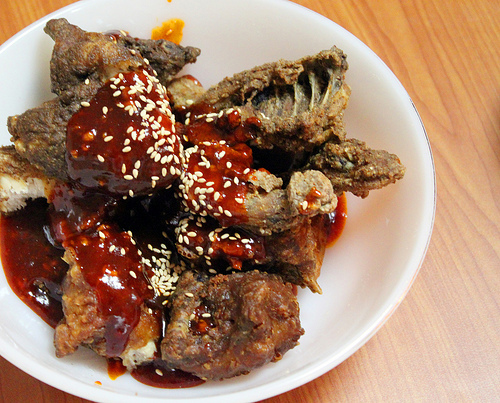 I made Korean fried chicken one time with just cornstarch! It was not something I wished to eat again. Thanks to you- I will once again try Korean fried chicken. I am a southern girl and know what good fried chicken is all about! Many thanks again! OK, I’m scared of deep-frying things, so I’ll just admire your efforts and be VERY happy that we’ve just had a Korean fried chicken restaurant open up in my town! It’s called CoCo and it’s really good. I have nothing to compare it to, but I like it! would it be fair to say that gyochon fried chicken and most hof style chicken in Korea are fusions from Japanese tebasaki or karaage chicken? I’ve had Japanese fried chicken only once, so I’m not really an authority on it. Did like what I had, though. Fried chicken didn’t take off in Korea until the American chains started moving in. Yet the taste of Korean hof chicken, the cinnamon scented kind, is unlike any other chicken I’ve tried. The lines are blurry many times with Japanese and Korean cooking. There’s some credence to the notion that yakitori came from Korean barbecue, which in turn came from the Mongols. Then there’s ararak, which was brought from the Middle East to Korea via the Mongols, turn into soju and then reformatted as souchu in Japan. I’ve had Japanese fried chicken only once, so I’m not really an authority on it. Did like what I had, though. Fried chicken didn’t take off in Korea until the American chains started moving in. Yet the taste of Korean hof chicken, the cinnamon scented kind, is unlike any other chicken I’ve tried. The lines are blurry many times with Japanese and Korean cooking. There’s some credence to the notion that yakitori came from Korean barbecue, which in turn came from the Mongols. Then there’s ararak, which was brought from the Middle East to Korea via the Mongols, turned into soju and then reformatted as souchu in Japan. Would the sauce above be good on fried shrimp? I’m pretty sure it would. Maybe even mix some wasabi or horseradish with it. Vow…Fried Chicken looks so delicious..Thanks for sharing such a great recipe in different style. Hey Fellas. I made the two two chicken. It was awesome. I did a slight variation. Using the dry flour coating method. Thanks Jason! Great tip. It makes it a little different than original Two-Two, which has a paper thin crust. But good is good, and you’ve improved on it. Oh my, my mouth is watering! My friend and I tried Hanchu’s chicken just a couple days ago, we’ve been craving it ever since we got back to Hawaii. Would you happen to know the secret behind Hanchu’s recipe? I would love to try to replicate their fried chicken and stuffed peppers. I think this article if super helpful and informative. I can’t wait to try your suggestions! !